Iran Presidential election-Karubi reformist candidate in Polytechnic.Students:Death to dictator,Death to this Government which deceives people. At least 16 well known journalists and web- writers are still in prisons in Iran! Without hope to be released and without American passport. This is when Ahmadinejad's Government at first arrests Roxana Saberi an Iranian-American journalist on the charges of espionage ( which is quiet a serious charges and if proven is punishable by death) and then releases at time of presidential election unexpectedly , while many Iranian journalists allegedly charged with less offences or no offences at all are still in prison.Why Ahmadinejad's Government do nothing to release these Iranian journalists and bloggers. Ahmadinejad's politics is dirty and intolerable by majority of Iranian.Ahmadinejad is doing everything to become re-elected as president.By releasing Roxana which is a good news for journalist communities , Ahmadinejad is taking the opportunity to show "humanist gesture ", but there are many Iranian journalists and bloggers who are behind the bars without any charges, just because they were critical to Ahmadinejad's government.While Roxana had the international support , these imprisoned journalist have very little support . This is a clear discrimination against political prisoners.Unfortunately , there are journalists and bloggers who are not living in big cities and it would be more difficult to monitor their situation. 1-Mohammad Sadigh Kabudvand- Managing editor of weekly " Payame Mardome Kordestan" ( Kurdish People's Message), regime has ordered for this weekly's closure. Mr. Kabudvand is also an international award winner and he is the president and founder of "Kurdistan Human Rights Organization ". Mr. Kabudvand is in Evin prison since june of 2007. 2-Mohammad Hossain Falahieh -Managing editor of closed Aghlamotalabeh newspaper and expelled reporter of Alalam Television. He is the longest serving prisoner in Iran. Currently he is in Evin prison since 2006. 3- Masoud Kordpoor - Journalist and teacher of kurdistan Ministry of Education.Currently he is in "Orumieh" prison since August of 2008.He was arrested by the Ministry of Information agents in the city of Bukan. 4- Nader Karami Juni - Editor and Journalist of publication such as" Jahane Sanat, Siasat Rooz, Gozaresh , Fekr " he is arrested since December 2008. 5- Kaveh Javanmardi- Journalist of weekly " Kerefto" . He is in prison since December 2006. He is sentenced to two years imprisonment and was forced to internal exile to the city of "Maragheh". 6- Adnan Hassanpoor - 25 years old Kurdish journalist is in prison since February 2006.Currently in Marivan city prison. 7- Heyva Butimar - 29 years old Kurdish journalist is in prison since February 2006.Currently he is in Sanandaj city prison.He is charged with espionage and is sentenced to death. 8- Bahman Totonchi- Journalist and member of editorial council of the banned weekly Kurdish language "Kerefto". He was arrested by the security agents of the Islamic Republic in his home. He is also member and founder of " Association of Kurdish Writers". He is currently in Sanandaj city prison. 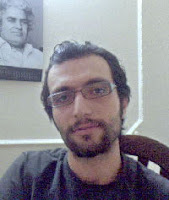 9- Mojtaba Lotfi - A clergy Blogger was arrested on early October 2008 by the order of judge Salimi. The security agents searched his home and took away with them all his writing , his computer and discs. He is sentenced to four years imprisonment.He is a close relative of Ayatollah Montazeri. He was editorial member of the banned "Khordad" and "Fath " newspaper and member of editorial council of banned weekly " Ava" and " Naghshineh". 10- On May Day rally in Iran many workers , students and civil rights activists have been arrested and were transferred to Evin prison,among them several journalist and bloggers and since then are in prison . Masoud Loghman, Alireza Saghafi, Alireza Firuzi , Amir Yaqubali, Nikzad Zanganeh , Kaveh Mozafari and Jelveh Javaheri are the blogger and journalist arrested. 11- Mr. Sajad Khaksari who was preparing report during teachers protest in May , 2009 was also arrested and is in prison. Iranian people are hostage of the Islamic Republic, Isn't it? if not, what is this? Mr. Behavar was encouraging the youth to actively participate in presidential election ,to observe and protect peoples vote and support the reformist candidates. This may be the case for his arrest. On Wednesday afternoon May 27,2009 Mr. Emad Behavar member of the political bureau and president of the youth branch of "Nehzat Azadi of Iran" party was arrested by several plain cloths security and intelligence forces of the Islamic Republic. After arrest the agents attended to Mr. Behavar's home and took away with them his personal belonging and documents . In order to put more pressure on him, they also ended his employment with a company and confiscated his passport. Behrooz Javid Tehrani the political prisoner has ended his hunger strike after 23 days! Behrooz Javid Tehrani is transfered to public ward number # 6 in "Rejaei Shahr" prison for now. Behrooz in protest to his prison condition went on hunger strike 23 days ago and ended the hunger strike when he was transfered by prison officials from solitary confinement to public ward. Roxana Saberi: I was under alot of pressure to confess that i'm an American spy ! "The interrogators told me , for not confessing, you may spend 20 years in prison and even you might be executed." Ms. Saberi said:"At that time i was very frightened." Saberi 32 years old journalist, after spending four months imprisonment in Iran, last week returned to America. Saberi also said: "My decision to go on hunger strike, after hearing i was sentenced to eight years imprisonment, was correct." She said : "My imprisonment was unjust , because i didn't want to confess and was telling the truth." She said: The announcement by the officials that i wasn't on hunger strike was meaningless, because for feeding, they connected me to serum.She said ; she doesn't know the real reason for her freedom and thanked all those who helped her to gain freedom. Simin Behbehani: My daughters, My sisters Unite for your human rights! Ms. Simin Behbehani the prominent Iranian literary personality , poet ,women's rights and a human rights advocate in a letter called all Iranian women to join the convergence and get together in their struggle for their rights. I'm proud of you and you have been the eye and the light to me. We have to work hard and control thing in our hand. We dont beg,we know our value. At the end i want to emphasize, that the Iranian women from all walks of life must join together for their human rights. May the flag of this unity be fluttering. First National Hymn of Iran - Solidarity of all Iranian for human rights! The birth of " Solidarity for Democracy and Human Rights in Iran"
A group of national personalities , members of political parties, organizations , civil and union rights activists, who agreed to be loyal to national sovereignty, independence, republic willing, democratic principle, human rights and fundamentals of freedom, have come together and brought a solidarity known as " Solidarity for Democracy and Human Rights in Iran" . 2-To accept the context of United Nations charter , the universal declaration of human rights and its covenants. 4-To change the constitution and remove articles that are contradictory to national sovereignty. 5-Separation of religion from Government. 6- To emphasize on democracy, human rights and fundamental of freedoms. 7-To emphasize on equality of the rights of all nationalies. 8-To emphasize on the equality of woman and man. 9- Elemination of all kinds of sexual , racial,ethnic , openion and faith discrimination . 10-Elemination of all kinds of violence and torture either through legal or arbiterary channels. 11-Protection of Farsi language as the root source of culture, unity and historical and national identity and to respect and embrace other languages in Iran. 12-Multilateral developement of socio-economic together with developement of social justice and elemination of all kinds of exploitation . (New York) -The Iranian government should immediately release ailing political prisoner Behrooz Javid-Tehrani, a human rights activist first arrested during 1999 nationwide student protests, and ensure he has access to adequate medical care, Human Rights Watch said today. Javid-Tehrani, who has been continually detained since 2005, is on hunger strike and suffers from health problems caused by prolonged torture. Labour working condition, reason for more protest in future ! "Syepa" workers gathered to protest against their working condition. Roxana Saberi arrived in Washington airport on last Friday and was welcomed and greeted by many friends ,colleagues and relatives! Behrooz Javid Tehrani the imprisoned student on his 20th day of hunger strike in "Rejaei Shahr" prison! behrooz was sentenced to seven years imprisonment , he is now in his fourth year , the prison officials together with public prosecutor keeping him in a solitary confinement Cell number one of Rejaei Shahr prison with his hands and feet chained. Behrooz is charged with membership to "Iran Democratic Front" and relation with " Mojahedeen " organization , he is also charged with " propagating against the system " . Human rights groups are worried about the life of Behrooz and requested from all human rights group to help his immediate release. Behrooz ! Khamenei the leader of the Islamic Republic can't hear you , but Iran Watch Canada heard you ! Behrooz Javid Tehrani's life is in great danger ! They are all responsible if anything happened to you. Behrooz Javid Tehrani the political prisoner is in his 16th days of hunger strike and according to report from "Rejaei Shahr" prison, his health condition has deteriorated because of hunger strike. Based on the same news , while his hands and feet are locked by chain, he is now in one of the solitary confinement cell number #1 in Rejaei Shahr prison and he continue his hunger strike. Mr. Javid Tehrani is the only student from the student uprising known as "18th of Tir " . Upto now spent four years in prison and all this time he was in Rejaei Shahr prison. Prior to this, he was also arrested and detained for months.In total he is sentenced to seven years imprisonment.During interrogation in ward number 209 of Evin prison , he was beaten in a way that he had brain injuries and because of that his left eye sight was damaged.Behrooz is one of those political prisoner who doesn't have any lawyer to defend him and because of that, he faces alot of pressure, discrimination and lawlessness. since three weeks ago, the prison officials forced Behrooz to be transfered to another location, location that is known as death chamber, location where Valiollah Faizmahdavi and Amir Heshmatsaran were brought and later died in that location. Presidential election in Iran and the candidates ! Ahmadinejad can't deceive Iranian people by giving them potato's. He started distributing potatoes among people of a city when he visited. He ordered his Basiji militia at night to go into the women student dorm and distribute 50,000 Tuman certified money order which was rejected and protested by the student and only shame remained for Ahmadinejad and his suporters including Khamenei who wanted to buy vote by paying them.He also promissed teachers to pay them 250,000 Tuman( $250). Ahmadinejad is the candidate of ultra right wing, the Motalafeh party , Basij and Sepah ( the young and old militia of the Islamic Republic) and off course Khamenei the leader of the Islamic Republic regime.Together with hissuporters ,they are cunningly trying to bring the style of Taleban regime in Iran.One of the most suspicious suporter of Ahmadinejad is Mesbah Yazdi known as the corocodile Ayatollah. He was the former chief of Sepah Pasdaran ( The Islamic Republic militia) . This say it all about him.He is also the candidate of Osulgarayan or the conservatives. 3- Mehdi Karubi former Ex- house speaker , he had many other post which was appointed by Khomeini. He is the owner of Etemad Melli newspaper a reformist newspaper. He is calling himself a reformist and wants to continue the reform.Many journalists , students and women activists supports him. He was the Ex-prime Minister of Islamic Republic in Iran . When Khamenei was president , he was Prime Minister. He shows himself as a Osulgara (fundamentalist) and reformist. Khatami the past reformist president supports him this time. So far, he has the largest support. In this election, the goal is to defeat Ahmadinejd who brought our economy , our society , culture and civil rights movement as well as the name of Iran in international stage on a dangerous edge. Let's not forget Hossain Akbari the imprisoned Iranian syndicalist and the president of "National Peace Council" ! National Peace Council's executive directors representative, have met the wife and childrens of Hossain Akbari the Iranian Syndicalist who was arrested and detained since May one the International Labor Day . Mr. Akbari is one of the prominent expert on Iranian Worker issues. 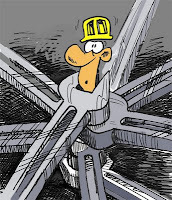 In the past he was the editor of workers service desk in "Nameh" publication .At his early youth ,he worked as moulder in "Mashin Sazi Arak" ( Arak car manufacturing company). While retired , he still work as moulder and he is also the president of "National Peace Council". In this meeting the family of Mr. Akbari explained that ; on May 1 the Labor Day celeberation was organized , Tehran municipality as well put beautiful placards on roadsides and the Metal & Mechanic cooperative also organized meeting of its members in their office. In the begining Mr. Satar Amini reported on financial situation of the coop and the rest of the meeting went by as the Ministry of Information agents were also present in the meeting. Ebrahimi, Eghbali, Amini, Akbari, Hatami, Darolshafaei, Rajabi, Sharghi, Gilani, Mohammadi , Marufi, Mirezaei, Noudahi, Vatankhah and Yari. 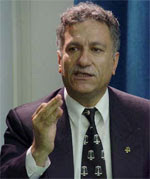 Mr. Emad Baghi, a leading Iranian human rights defender based in Tehran. He founded the Society for the Defence of Prisoners’ Rights, and has been a vigorous and outspoken opponent of the death penalty in Iran. His campaigning includes a scholarly examination of Islamic law (shari`a) on the subject, in which he demonstrates the absence of any doctrinal requirement for maintaining capital punishment. In addition, Mr. Baghi’s inventory of death row prisoners in Iran, including juvenile offenders, has been an important resource for UN human rights bodies as well as human rights groups outside the country. Mr. Baghi has spent four years in prison over the past decade for his campaigning against the death penalty and other rights activities. Currently out of jail, he still faces charges relating to his work for the defence of prisoners rights. Mr. Baghi suffers from serious heart and kidney ailments; in August 2008 physicians of the prison in which he was detained declared his condition critical. The Chairman of the Jury of the MEA, Hans Thoolen, describes the laureate as “an exceptionally brave man defending human rights despite imprisonment and poor health”. The Ceremony of the Martin Ennals Award will take place in Geneva in November 2009. MEA: the main award of the human rights movement. The Martin Ennals Award for Human Rights Defenders (MEA) is a unique collaboration among ten of the world’s leading human rights organizations to give protection to human rights defenders worldwide. Previous laureates : Mutabar Tadjibaeva, Uzbekistan (2008); Pierre Claver Mbonimpa, Burundi and Rajan Hoole-Kopalasingham Sritharan, Sri Lanka; Akbar Ganji, Iran and Arnold Tsunga, Zimbabwe; Aktham Naisse, Syria; Lida Yusupova, Russia; Alirio Uribe Muñoz, Colombia; Jacqueline Moudeina, Chad; Peace Brigades International; Immaculée Birhaheka, DR Congo; Natasha Kandic, Yugoslavia; Eyad El Sarraj, Palestine; Samuel Ruiz, Mexico; Clement Nwankwo, Nigeria; Asma Jahangir, Pakistan; Harry Wu, China. Patrons of the Martin Ennals Award: Asma Jahangir, Barbara Hendricks, José Ramos-Horta, Adama Dieng, Leandro Despouy, Louise Arbour, Robert Fulghum, Theo van Boven and Werner Lottje†. Jahan News : "Fararu" website is filtered! Mr. Mohammad Hossain Khoshvaght the manager of the site, does not know about the source of the filtering . He added: Filtering is done by; judiciary power,committee of appointed arbitrators and a group websites organizers. "Fararu" is a reporting and analyzying website and it is filtered since yesterday. 10th Islamic Republic presidential election in Iran ! 471 candidates competency for presidential election was rejected by guidance council and only four candidates were found competent. According to Kamran Daneshju the head of election headquarter; in this presidential election 475 candidates registered their names , out of these, 433 were men and 42 others were women. The presidential election will take place on June 12th,2009 in Iran. 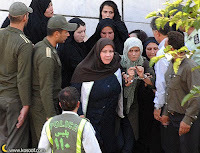 Picture shows jila Baniyaghoob with handcuff sorounded by women and men security and police forces of the Islamic Republic. Jila Baniyaghoob, freelance reporter and editor-in-chief of the website Kanoon Zanan Irani (Focus on Iranian Women), won the International courage award in journalism. IRAN WATCH CANADA congratulate Jila for her courage and receiving this international award. 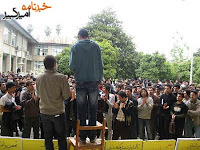 A student of "Ferdousi" University critical to regime , and to its leader and Government was attacked by agents present. Cry my country , cry loud ! Mohammad Poorabdollah's the imprisoned student mom :If my son is not released , i will kill myself in the court. The mother of Mohammad Poorabdollah the imprisoned student: My son can't walk, who is going to pay the "Diyeh" of his foot? "Diyeh" is an Islamic legal term for example in case of " an eye for an eye " or compensate by paying for an eye. accepting and receiving the payment by the victim or victims family members is called "Diyeh". Since the Islamic law is carried out against the Iranian public, here a mother charging the Islamic officials to pay the "Diyeh" for damaging her son's foot by torturing him in prison. Mohammad Poorabdollah is a left wing student of Tehran University who was arrested in last December and is still in "Ghazal Hesar " prison. 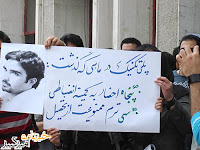 The mother of this student who during the last three months demanded for her son's release, complaining against the judge for telling her lies , she said:" Why my son must stay in prison , because he is Iranian? If he was foreigner, he would have been released? After all these time, yesterday i was able to see my son in prison, he is in public ward of the "Ghazal Hesar " prison where the criminals are also being kept, in meeting , i noticed that he coulden't walk well, by asking him repeatedly , he didn't answer , when he pulled his pants , i saw bruises and swelling on lower part of his knees. He himself didn't say anything but i know that they have severly tortured him in cell number 209 . He has now tooth pain , they do not give medication , every week five prisoners are brought in the clinic but they dont give them medication, i bought medication for his pain but the prison officials dont allow me to give it to him, In a prison where everybody is addict , the prison hygen is below zero, on what kind of security and credit my son go to clinic and let thm to pull his teeth? The food situation is also bad , while i bring his needs for him , i also give him 50,000 Tuman every week to buy foods and cook their own foods, Should the situation of prison be like this? Why my son should stay in prison, In what crime my son must stay in "Ghazal Hesar " prison? If his charges are political , why he must stay in "Ghazal Hesar " prison, Why they dont transfer him to Evin prison? The Islamic court have told Mr. Mostafaei- his lawyer, they would prepare him for a bail, two days he was brought back to court , imagin if a mother will see her son in this situation, that a 23-24 year old boy be handcuffed with a 70 years old drug addict man, off course all are human, there were empty chair in the court but the officers didn't let them to seat, they sat on the ground , aren't they human? Judge Sobhani says he has no problem for his release , but deputy prosecutor dont agree! The court officials are asking him to write and sign by accepting about the charges, but my son is saying that he didn't do anything to write and sign , they say; he wrote on blog, but now everybody is writing on blog.The Islamic Officials just want to hurt people , they bother people , are they mosles? At the end she Said : "Judge Sobhani or Shahroudi , why dont you bring justice to people" ? She threatened if her son is not released , she will kill herself in the court. Islamic Republic Officials including the leader of the regime Khamenei know about the imprisonment of these students and still try to ignor and keep silence about their situation. This is immoral , inhuman and continous crime against humanity. Masoud Dehghan the imprisoned student is banned from the visiting rights! Masoud Dehghan is one of the student of Polytechnic University who was arrested during the attack on Polytechnic University in April by the Islamic Republic.Mr. Dehghan is currently in solitary confinement cell number 209 in Evin prison. Mr. Dehghan's mom who have gone to Evin prison to visit her son was told by the prison guards that her son is banned for visiting rights. This was happening while the court have told her she can visit her son on Saturday May 16. Majid Tavakoli,Abbas Hakimzadeh, Mehdi Mashayekhi and Masoud Dehghan. Publication of "Yase Nou" newspaper is banned by Ministry of Guidance and Said Mortazavi Tehran public prosecutor ! Said Mortazavi is known as the butcher of reformists media! The experience and history shows that , when the position of anti-modern , conservatives and in the case of Iran the fundamentalists are weakened or taken by the forces of reformer or advanced modern and civil rights forces , they react by moving forward and showing their teeth to the people and their organizations. Said Mortazavi is one of those fundamentalist forces known as anti-civil rights. Time to time, he comes out of his place due to either order or breathing difficulties. Once again he showed his teeth and his adversary with independent media and reformists or independent journalists. This time his victim is the "Yase Nou Newspaper" . Just after one day publication ( number one ) , he ordered its closure. Minister of guidance together with Said Mortazavi the public prosecutor of the Islamic Republic judiciary system in Tehran sent their agents at late night of May 16 to stop printing of "Yase Nou" newspaper. As a result , many journalists lost another job. This is the third time this newspaper is targeted by ministry of guidance. Mr. Mohammad Naimipoor the manager in charge of "Yase nou" told to ILNA reporter that ; the closure of newspaper is illegal and he believes political interest and presidential election had something to do with papers closure. After four months in Evin prison, Roxana Saberi the Iranian- American journalist was released on Monday May 11 and left Iran on Friday May 15 for Vienna -Austria together with her mom and dad. Roxana 32 grew up in North Dakota-USA and on 1997 received the title of Miss Dakota. In the past she lived six years in Iran. She told reporters that, she choose to go to vienna for a few days rest and will speak on her ordeal later on. 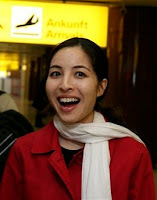 1-US-Iranian journalist Roxana Saberi smiles as she arrives at the airport in Schwechat, Austria, on Friday, May 15, 2009. Saberi, the American journalist accused of spying on Iran, has arrived in Austria after her release from an Iranian jail. 2-Iranian movie director Bahman Ghobadi (C) waits for the release of imprisoned Iranian-American reporter Roxana Saberi outside Tehran's Evin prison on May 11, 2009. Ghobadi, in Cannes with an underground movie from Tehran, says the country's tight censorship and restrictions mean he "may not go back". 3-Iranian-American reporter Roxana Saberi smiles as she arrives with her father Reza to brief the press outside their home in Tehran on May 12, 2009. A lawyer for US-born reporter Roxana Saberi, freed this week from a Tehran jail, said on Wednesday the spy charges she had faced arose after she obtained a classified report on the US war on Iraq. 4-A frame grab shows U.S.-born journalist Roxana Saberi (R) being embraced by her mother Akiko Saberi after being released from Tehran's Evin prison May 11, 2009. REUTERS/via Reuters. Vanessa Kirunda is the last person you'd expect to be looked down on. Poised, articulate, educated and confident, Kirunda, a black woman, can dissect and analyze why Canadians treat her differently. But all bets were off when schoolmates called her 10-year-old son Sean a n-----. Three times. Three different children. "I anticipated this would happen, but it breaks my heart. Something is wrong when children say these things. On top of everything, I'm not going to have my child degraded," said the Mississauga resident. The "everything" she refers to includes being sent to an Adult Learning Centre when she arrived, even though English is her first language, and getting passed over for a college spot in favour of a white friend. "I've never understood people who believe they are more superior. It's based in idiotic ideologies. And it's not just white European people." Kirunda and her son, Canadian citizens who emigrated from Kenya six years ago, face exactly the sort of walls a major study of multiculturalism and society pinpoints. "We were surprised that religion didn't have more effect," said lead author Jeffrey Reitz. "It came down to race, with Asian people reporting some and with young black males the most stigmatized. The data is consistent with that. "We tend to believe racism is a minor problem in Canada, of little consequence. Someone looked at them funny. Or that many immigrants are doing well, so it must be their fault if they aren't. There is a reluctance to investigate the issue." The problem isn't multiculturalism, spawned in 1971 by then-prime minister Pierre Trudeau, the study concluded. "A lot of people in Canada revel in diversity. They were happy to say goodbye to liver and onions, hello stir-fries and samosas," said Reitz. But the original idea of multiculturalism saw integration as the marker of success: A second generation equally accepted in the mainstream and in the ethnic community. "We need to address these feelings of isolation," said Reitz. "Among minorities born in Canada, blacks have the lowest sense of belonging, the lowest level of trust in others and the weakest sense of Canadian identity. They are the least likely to vote," Reitz and Ryerson University assistant professor Rupa Banerjee wrote in the book Multiculturalism and Social Cohesion. "Among recent immigrants, blacks have high levels of volunteers but among the second generation this has disappeared." Reitz pointed out that the first wave of migration of blacks from the south in the United States were embraced for their culture and differences in the north, creating places such as the prosperous, dynamic Harlem in New York City. A few generations later, Harlem was a ghetto that exploded into race riots. "I'm not saying that is going to happen here. But we have indications of social problems in communities. There is the perception of a crime problem. Some children of immigrants have high dropout rates. We ought to be asking why." The study used data from Statistics Canada's 2002 Ethnic Diversity Survey. In the last seven years, said Reitz, "attitudes have improved in race relations. But they aren't reflected in reduced discrimination. Better is not good enough." Kirunda, a registered nurse who is taking graduate nursing courses at Ryerson University, would agree. "I'm a single black mum with a black boy. In Canada, there is more compassion for that than in the States. Here, I knew I was going to be supported." She pauses. "If I did most of the hard work." ALERT - IRAN 13 May 2009 More arrests reported as government continues crackdown on onlinejournalists SOURCE: Reporters sans frontières (RSF), Paris (RSF/IFEX) - Reporters Without Borders is concerned to learn of the arrestsof two more Iranian journalists in the past two weeks, bringing the totalnumber of journalists and bloggers currently held in Iran to 15, includingtwo women. "Although Roxana Saberi was freed on 11 May many other journalists havebeen arrested in the past two weeks with little being said about it,"Reporters Without Borders said. "The Iranian authorities have quietlyincreased the number of detained journalists." 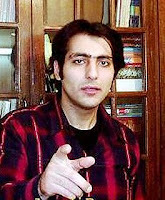 Massoud Loqman, the editor of the arts and culture website Rouznamak (http://rouznamak.blogfa.com/ ) and a member of the Association of IranianJournalists, was arrested in the centre of Tehran on 1 May. He was thevictim of police violence at the time of his arrest. On the evening of 1May, intelligence ministry officials searched his home without a warrant. He was one of a total of six journalists and cyber-dissidents to bearrested on 1 May in Tehran. The others were Alireza Saghafi, editor of themagazine "Rah Ayandeh", journalist Kaveh Mozafari, who writes for twowebsites FeministSchool ( http://www.feministschool.com/ ) and Wechange,also known as Change for Equality ( http://www.4equality.info/ ), JelvehJavaheri, who also writes for FeministSchool, Amir Yaghoubali, who writesfor the daily "Etemad" ( http://www.etemaad.ir/ ) and Wechange, and NikzadZangane, who keeps a blog ( http://www.nik-nevesht.blogspot.com/ ). 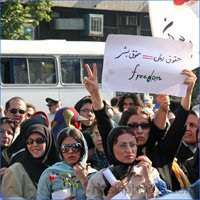 Onlythe two women's rights activists, Javaheri and Zangane, have been able tocontact their families since their arrest. The other newly-reported detention is that of Sajad Khaksari, a journalistwith the weekly "Galam Moalem" ("Teacher's Pen"), who was arrested on 26April for photographing a demonstration by teachers. A judge initiallyordered his release on bail but then reversed his ruling. Reporters Without Borders also condemns the fact that two journalists whowork with Nobel peace laureate Shirin Ebadi's Human Rights Defenders Centre- Nargues Mohamadi and Soraya Azizpanah, editor of the Kurdish magazine"Rasan" - were prevented from leaving Iran on 8 May to attend a conferencein Guatemala on women's rights. For further information contact Soazig Dollet, RSF, 47, rue Vivienne, 75002Paris, France, tel: +33 1 44 83 84 78, fax: +33 1 45 23 11 51, e-mail:middle-east@rsf.org, Internet: http://www.rsf.org/ The information contained in this alert is the sole responsibility of RSF.In citing this material for broadcast or publication, please credit RSF. The IFEX Digest is a service of the International Freedom of Expression eXchange (IFEX), a global network of non-governmental organisations working to defend and promote the right to free expression. Visit the IFEX website for more information. Students rallied " For Freedom" ! Placard reads: Polytechnic in the last month - 50 students were summoned , 30 semesters deprived from education. On Monaday Students were planning to rally " For Freedom" in Polytechnic University but the diciplinary committee and "Herasat office" of the university banned 35 students of the university to enter into the campus on the same day. The students rallied for the freedom of their colleagues who are currently in prison and no one in the Islamic Republic is talking about resolution in their situation.In this gathering the students chanted freedom slogans, carried the pictures of the imprisoned students and placards and demanded for the release of imprisoned students. The film 'We know nothing of Persian cats' by Iranian Bahman Ghobadi open programming ‘Un Certain Regard’ which is part of the official selection of the Cannes Film Festival (May 13-24), Monday announced its organizers. Former assistant of his compatriot Abbas Kiarostami and actor of the film ‘The Blackboard’ by Samira Makhmalbaf, Ghobadi won the Caméra d'Or and international criticism prizes in 2000 with his first feature film ‘A time for drunken horses’, presented at the Directors' Fortnight. ‘We know nothing of Persian cats’ shows Iranian youth through portraits of rap musicians who compose illegally, in Tehran. Winner of the Jury Prize last year with ‘Il Divo’, a vitriolic portrait of the politician Giulio Andreotti, the Italian director Paolo Sorrentino will chair this year's jury for the ‘Un Certain Regard,’ and will be surrounded by four jurors. They are actress Julie Gayet (France), Festival director Piers Handling of Toronto (Canada) and journalists Uma Da Cunha (India) and Marit Kapla (Sweden), announced the organizers. Roxana Saberi the Iranian-American journalist will be released today! According to news , an appeal court in Tehran on Sunday reduced the 8 years imprisonment sentence of Roxana Saberi to two years pending sentence . It took five hours the court to make new decision , said Mr. Saleh Nikbakht one of Roxana's lawyer. Mr. Nikbakht said ; Roxana was optimistic with Sundays court proceeding. Khamenei the regime leader and other high ranking officials including judge Hadad are responsible for all these injustices! On the morning of May 8,2009 Ms. Narges Mohammadi the spoksperson for the " Centre for Human Rights Defenders" in Iran and her colleague Ms. Soraya Aziz Panahi another women rights advocate while entering into the Airplane were arrested by the security forces of the Imam Khomeini International Airport. This two women's rights advocates together with Jila Baniyagub , Homa Madah and Laila Arshadi were on their way to attend in an international seminar on women issues in Guatemala. According to report , they didn't have any problem when leaving the country , they even had their exit permit but the security forces from the office of president prevented their departure from the country. The passport of Ms. Mohammadi and Aziz Panah was confiscated by the security agents. Narges Mohammadi showed a letter which indicate banning her from leaving the country and summon to the court. She said this letter was issued by a division which runs by judge Hadad. Abdolsamad Khoramshahi :Roxana Saberi's appeal court will take place on Sunday May 10! Mr. Khoramshahi the Roxana Saberi's lawyer said ; the appeal court of Roxana the Iranian-American journalist will take place on Sunday May 10. Mr. khoramshahi added : the court hearing will start on 9:00am Iranian time. Ms. Saberi is sentenced to 8 years imprisonment on the charges of espionage for US. Mr. Khoramshahi said ; he hopes his 15 pages of defense argument will be heard and his client be aquited. Ms. Saberi is 32 years old and for the last six years she resided in Iran and was working for NPR an America Radio , BBC and FOX news. Although Islamic Republic authority believe that she was working as a journalist without news reporting permit.She was arrested on January 31st ,2009 and at first it was told she was arrested for having alcoholic beverage but the charges later was changed to espionage for US. During her imprisonment in protest to her sentence Ms. Saberi went on hunger strike for two weeks and according to her father ended the hunger strike on May 6. Iran Watch Canada believe that; this journalist has becom a target of Ahmadinejad's Government for political gain in the coming presidential election on June. Iranian journalists demanded for the release of Roxana Saberi! On May 3rd the International Press Freedom Day , Iranian journalists protested against the arrest and imprisonment of Iranian - American journalist Roxana Saberi and demanded for her release. The Iranian journalists as well condemned abusing journalists for the political gains. the journalists who signed the petition demanded for a fair trial for Roxana Saberi. Khamenei the regime leader and other officials of the Islamic Republic are responsible for the actions of their security forces! "IWC"
Ms. Jelveh Javaheri active member of " Campaign for one million signature" is arrested hours after her husbands arrest! Ms. Jelveh Javaheri active member of " Campaign for one million signature" is arrested hours after the arrest of her husbands Mr. Kaveh Mozafari, she is also transfered to prison. The security forces hours after the arrest of Mr. Kaveh Mozafari in May Day rally in Tehran "Laleh" Park , took him to his house in Jomhouri Street to search his residence and his wife.After searching the residence the security forces took with them two computer, many cd's , books and their hand written matterials. According to the family of Ms. Javaheri, after the search of residence they arrested and transfered Jelveh Javaheri to prison. 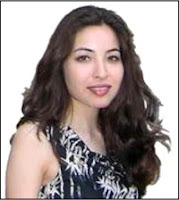 Ms.Jelveh Javaheri is a social science researcher and a writer of the website known as " School of Feminism". Khamenei and Islamic Republic officials neglect the rights of Iranian citizen to have a committee to overlook the presidential election in June! Instead, the government officials arrested a member of the committee. Committee defending for a " Free , Fair and Healthy Election " in a communique protested to the arrest and detention of Mr. Mehdi Motamedi Mehr ,one of its active lawyer, human rights advocate and member of the committee and demanded for his immediate release ! The communique indicated that ; unfortunately the official Goverment news agencies and media made some allegation against Mr. Motamedi Mehr which is illegal befor any judicial proceeding. Roxana Saberi is transfered to Evin prison clinic! The News Agencies according to " Reporters Without Borders " announced that ; Ms. Roxana Saberi was transfered to the clinic of Evin prison for weakness and poor health. Mr. Jamshidi the spoksperson for the Islamic Republic judiciary power in speaking with reporters rejected Ms. Saberi is in hunger strike. public can make their mind whom to believe ; Mr. Jamshidi or the father of Roxana? After visiting his daughter earlier in Tehran Evin prison, Mr. Saberi told reporters that Roxana is on hunger strike. The political game of the Islamic Republic judiciary power continues....! Iran Watch Canada, do not believe this man at all. According to ILNA , Mr. Alireza Jamshidi the spoksperson of the judiciary power in speaking with reporters on the situation of Ms. Roxana Saberi rejected the report that Roxana is on hunger strike and said: "Saberi is in good health and if we find problems, it is our duty to follow it up." The organizing committee of May Day rally for the year 2009 expresses its congratulation and applauds the workers movement for this incomparable success of the event by different but united activities and this is a turning point in the struggle of Iran workers movement and a defeat for the Islamic Republic effort to prevent this united activity. The organizers expresses its despise and dislike of savage suppression of the event. The organizers condemn this inhuman and savage action and demands the immediate and unconditional release of all those participants arrested in the May Day rally. Because of the organizers call for May Day rally , many workers, workers rights activists , their families and other people at 5:00pm on Friday came to Laleh Park to support the workers cause. The security agents from days before the event by summoning the workers or calling them by phone and threatening them and following them , were trying to create an atmosphere of fear among those workers who wanted to participate in the May Day rally. The plain cloths security forces attended in the park so many hours earlier , as well the "Herasat" forces ( a kind of security forces) from each companies and factories including the United Bus Drivers attended in the park to recognize and show the workers to security forces to arrest them. They also did video taping of the participants , who despite threat of arrest and imprisonment attended in the event. The increasing number of participants in the Rally brought anger among the security forces of the Islamic Republic, who did their outmost effort not to let this event take place. Right after the beginning of event, while the workers were chanting slogans such as; “Long Live Workers Movement”, and “Workers Unite, Unite” the security forces attacked on May Day rally participants with baton and electric shock , they also used a kind of coughing gas which was burning the eyes . some of the workers started to fight back with security forces who were trying to arrest them. So many of these security forces in several group tried to disperse the participants by attacking them and as a result more than 150 peaceful May Day rally participant with different age range were arrested and are in detention. Ms. Maryam Mohseni, Ms. Fatemeh Shahnazari, Ms. Parvaneh Ghasemian, Mr. Taha Valizadeh, Mr. Pooya Poshtareh, Mr. Amir Yaghubali, Mr. Kaveh Mozafari, Mr. Mohammad Ashrafi, Mr. Said Yuzi, Mr. Behruz Khabaz, Mr. Jafar Azimzadeh, Mr. Mohammad Faraji, Mr. Alireza Saghafi and Mr. Mohsen Saghafi. Do you remember Delara, the young offender allegedly according to Islamic Republic judiciary commited a crime when she was 17 years of age and while in prison she did so many beautiful painting , she was hanged on Friday at the age of 23 . The crime against humanity by Islamic Republic officials has to be heard in a national and international public tribunal and the evidence against each individual officials must be presented by victims family members and by documents or exhibition at national and international stage. Crimes that are commited on daily bases and the ignorance and deaf ear of the officials to the out cry by Iranian citizen and international organization must be documented and monitored like what the IRAN WATCH CANADA is doing and by Iranian able to speak and write different languages in their respective countries first to make them aware and second to let the international organization know what is exactly going on in Iran. I ask the Islamic Republic official to read " The Bet" story written by Anton Chekhov and stop their inhuman actions once and for all. Iran secretly hanged a juvenile offender early today despite a flawed trial, a stay of execution and an unequivocal international ban on such executions, Human Rights Watch said. 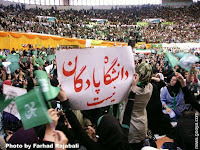 Why Islamic Republic affraid of " Committee for Free , Fair and Healthy Election " ! Mohammad Ali Dadkhah is a lawyer and member of the "Centre for Human Rights Defenders" . "On Tuesday they( the security agents)contacted me and said this meeting must not take place. I told them since the meeting was planned from befor, let us to hold this meeting and in the future we will take decision . But Yesterday the security agents attended in "Rad Law Building" and prevented the committee members to hold the meeting. In this meeting ( on Wednesday) i wasn't there and was attending in a seminar in Persian Gulf ." According to one of the member present in Wednesday's meeting , the security agents attended in the building and said ; from now on, meeting with different title must stop in this building.Mr. Dadkhah said : Since the establishment of "Rad Law Building", every year four historic national celeberation social event were taken place in the building , celeberation such as : Mehregan, Yalda, Nowrooz and Ramdan . Mr. Dadkhah believe that , every lawyer must have interest to his homeland and love it, othervise his identity , credibility and personality will go under question and these national celeberation is part of our identity and nationality which we hold with honor .